Two of the most common loads for stoking a rifle chambered in 5.56x45mm are M193 and M855 equivalent rounds. I say equivalent to describe them because both the M193 and M855 are military cartridges; any loads proclaiming to be the same on the commercial market are either copies, or very similar to those military loads, but not actual “mil-spec” ammo. Huh? What does that mean? And what about the boxes of ammo we see with an ‘X’ in the designator, like Federal’s XM193? Is this stuff any good? And what’s the difference between M193 and M855 in the first place? Isn’t one a “penetrator” round? Like, armor piercing? All this may seem pretty complicated depending on what you’ve heard, but in reality our sets of differences boil down to, essentially, markings on a box and then the physical differences between the cartridges themselves. In this article I’ll explain what’s what when it comes to purchasing either type on the open market, and the differences in performance you can expect from them. The M193 cartridge, and true equivalents, push a 55 grain, boat-tail, lead core FMJ bullet with a specified muzzle velocity of appx. 3,165 feet per second. Both primer and case mouth are chemically sealed against moisture infiltration, an important feature of military ammunition, or any ammo to be used in harsh conditions. The bullet is unmarked, nothing to see except the copper jacket. First combat tested in Vietnam for the then-new M16 rifle in the early 1960’s, it was formally adopted in 1964. This served as the primary rounds for M16’s until the early 1980’s when the M855 was standardized according to a NATO agreement. The M193 pushes a light, short exceedingly fast round designed when M16’s had barrels with much slower rifling rates of 1:12. While that was more than adequate to stabilize the M193, it proved inadequate for longer, heavier projectiles like the M855 and especially M856 tracer that came later. Today, all M16 and M4 variants have far faster 1:7 twist rates and many commercial AR variants have the same, or the commonly seen 1:9. As far as performance is concerned, the M193 is capable of very good accuracy, and above a certain velocity threshold (broadly, about 2700fps, but err on the side of 2850fps +) may fragment severely inside a target, causing significant wounding. Disadvantages are it is a very poor performer through any kind of intermediate barrier, and sheds velocity quickly, resulting in reduced effectiveness at range. Additionally, when the bullet fails to fragment, it has a reputation of producing only minimal wounds. Velocity is one of the key metrics for getting anything approaching consistent fragmentation, and even at ideal velocities it is not guaranteed. The M193 was in fact subject to much complaint from users in the military who did not see any significant effect from shooting an enemy with it, or experienced very poor results after engaging through glass, brush or other obstructions. Most of these ballistic shortcomings would be addressed with the introduction of the M855 in 1982 (more on that in a minute), but this cartridge was one of the cornerstones that led to the 5.56mm’s reputation as a poor combat performer. Nonetheless, the round and its clones are plentiful and popular today with civilian shooters, especially for close range training and practice and it will generally shoot stably and reliably from any 5.56mm gun, although best results are often experienced with slower twist barrels. The M855 cartridge and true equivalents fire a 62 grain, boat tail, lead core bullet with a steel penetrator. Specified muzzle velocity is appx. 3,020 feet per second. The primer and case mouth are sealed like the M193. The bullet is marked with green paint on the tip, a distinctive identifier. First adopted by the U.S. Army in 1982 and intended for use in the M249 SAW in the wake of NATO standardization agreements, later development of the M16A2 (which featured a faster rifling twist) led to the M855 becoming the general purpose 5.56mm battlefield round. The M855’s defining characteristic is that steel penetrator section just ahead of the lead core, designed to aid performance against hard targets. Note that while not a true armor piercing round, it was intended to work well against light armor of the day and other materials, and also enjoyed better performance at long ranges thanks to a superior ballistic coefficient compared to M193. A quirk of the M855 is it is very long for its weight, longer than some 69 grain projectiles. It works just fine in 1:7 twist barrels, but there have been reports that it is not adequately stabilized by some 1:9 twist barrels, and certainly not by a 1:12 barrel. This is seen as a curiosity by some owing to the fact that common conception is a 1:9 twist barrel should handily stabilize projectile in the 62-69gr. range. But in point of fact, a faster twist is needed to stabilize longer, not just heavier projectiles, where a slower twist will stabilize only shorter, lighter projectiles. This is speaking somewhat broadly, and precisely calculating optimal spin rate for stabilizing any given projectile is a mathematical tour-de-force, involving density, velocity, bearing surface of the bullet and so forth, but this simple explanation suffices for the M855. As far as performance is concerned, the M855 is capable of good accuracy but has an edge at longer ranges over the M193. Where this round shines over the M193 is its more reliable fragmentation characteristics and improved performance through intermediate barriers. Light metal, brush and dense fabric will do little to disrupt the M855. Heavy masonry and automobile glass, as well as modern armor, will still greatly disrupt or defeat it, however. Remember, it is not a true AP round. Velocities above appx. 2,800 fps will see the M855 regularly fragment in a target, though it has a reputation of sometimes fragmenting too late in its passage to produce good wounding effect. At any rate, testing and battlefield analysis has proven it to be a superior “all-purpose” round from most weapons compared to the M193. In service, it has been generally well liked by users, but is currently being replaced in military inventory by the M855A1, designed to offer the same trajectory as the M855, but even greater performance through barriers and improved wounding capability. On the commercial market, the M855 equivalents are common since the BATF reversed their decision to classify the round as armor piercing in 2015. That announcement led to panic-induced rushes, hoarding of supply, and subsequent shortage. It is inexpensive, though usually not as cheap as M193 and commonly used for training and practice shooting. Its popularity is curbed somewhat by ranges’ tendency to ban its use both indoors and out, thanks to the bullet’s propensity to chew up steel backstops and spark, sometimes starting a fire in dry conditions. All said, it is a fine general purpose cartridge even today, though outclassed by more modern loads. M, XM: What’s the Difference? 1.) XM-series ammo offered by Federal Cartridge, Winchester and Hornady is made by the Lake City Army Ammunition plant for those companies. All are generally high-quality, reliable loads. It is not truly “mil-spec,” but is made to closely mirror in both assembly and performance the military specification. 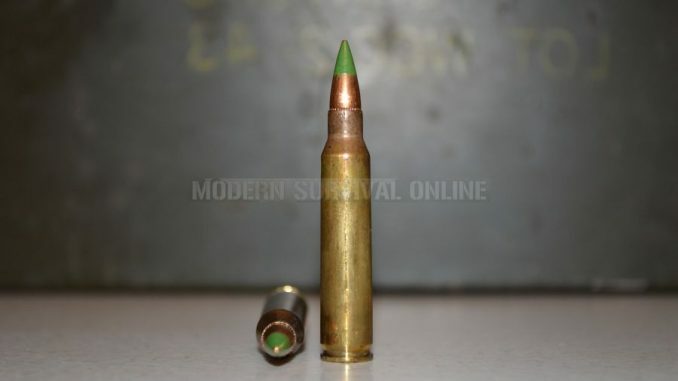 If you are really hard-bent on “mil-spec” you can publicly source the military specifications for both M193 and M855 cartridges then give any of them a call to compare notes. 2.) Commercial ammo by other companies made to be close to M193 or M855 in performance, and sometimes assembly. The box may be marked “M193,” but, again, that does not mean it is the real deal. Some companies’ loads actually vary somewhat drastically on performance, especially velocity, so do your homework before assuming you’ll get specific results from it. Much of it is good, but some is not. M193 Spec or M855 Spec – Which Should You Choose? All around M855 is superior, though the M193 is capable of better effectiveness against soft targets in ideal circumstances. The M193 fares poorly against any kind of intermediate hard barrier compared to M855, but both are more than capable of piercing heavy fabric and soft armor with good effect. Both rounds are largely dependent on velocity for good performance, so longer barrels help in this regard, but the real determining factor for many will be the barrel’s twist rate. If you are stuck using 1:12 barrels, forgo the M855 and similar rounds entirely. You might warrant a try, but be sure to test them at extended ranges, as sometimes destabilization of the round will not show itself at point-blank or close range. Destabilization is indicated by significant loss of accuracy after a certain distance and “keyholing,” an oblong bullet hole that indicates the bullet was sideways when it struck the target. If you have a 1:9 or 1:7 twist barrel, you should be good to go for either, but the 1:7 definitely favors the use of M855 and heavier loads. Neither round is a top performer today, and not my first choice for defense (and shouldn’t be yours, either) but if you have laid in a good supply and practice with it regularly both will perform satisfactorily if you understand their respective limitations and how they behave fired from your rifle. If you are committing to one or the other, note that some magnified optics, like the Trijicon ACOG for instance, come in variants with reticles calibrated for the trajectory of a certain load, M855 being quite common. Both of these legacy 5.56mm cartridges, rather their commercial clones, are ubiquitous, and still keeping thousands of rifles firing today. While neither is known for world-class performance, their low-cost, easy availability and consistency make them viable, popular choices for training and preparedness. So long as you understand how they will behave in your rifle, either will serve well for a general purpose load. Should You First Prep for Doomsday or for Emergencies? BFSMan: No no. Cheney”s not a zombie. He”s an evil robot. I”ve got proof of the robot part laying around here somewhere. It”s a picture of him with his belly hatch open on the cover of a tabloid newspaper that I picked up from the grocery store years ago. As for the evil part, well, Iraq, weapons of mass destruction, the destabilization of the already most volatile region in the world, and shooting his buddy in the face with a shotgun cuz they wouldn”t let him go to Bagdad and personally waterboard some poor schmuck that got accused of hiding Saddam by his neighbor who wanted to steal his wife. Proof. Mike drop. I would like to see an article on the best rounds for home defense use.